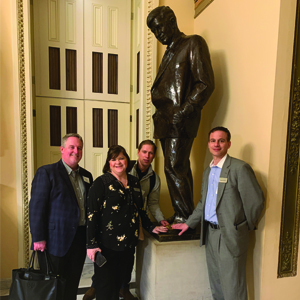 Over Spring Break students enrolled in the CoBPA’s Government and Business graduate class took a trip to Washington D.C. The trip tied together class work with real-life experiences, which supports the CoBPA’s commitment to experiential learning opportunities. “The trip to Washington DC for the Government and Business course made clear the real-world implications of concepts addressed in our classes. The opportunity to network with established professionals and learn from their experiences was extremely valuable,” said MPA student Nicole Derenne. While in D.C. the students were introduced to many distinguished individuals in the city including several UND alumni. The week began on Sunday evening with a reception at the home of Carolyn and Mike Becraft, who support UND students attending public administration conferences through the Carolyn & Michael Becraft World Affairs Endowment. Early the next morning, meetings began in the city. Throughout the week, students got the chance to see many places around D.C. including the FDIC, Microsoft, Cargill, the IBM Center for the Business of Government, Delloite GOVT Relations and the Russell Senate Office Building just to name a few. MBA student, Evan Moser, really enjoyed the experience he received from attending the trip. “The trip was really eye-opening for me, as an MBA student, you don’t always get to see the connections between business and government in practice. Being able to sit in with some of these big-name companies like Microsoft and IBM and see the need for interaction between business and government made for a great learning experience,” said Moser. On the final evening of the trip, the students attended the UND Alumni Association Reception at the Russell Senate Office Building with President Kennedy and Dean Henley. Thank you to everyone who helped to make this trip possible for our students!